Probably every woman around the world couldn’t wait for the moment to see Catherine Middleton’s wedding gown on the day of her marriage to Prince William. Finally the big day came and she received the high valuation of the elegant and classy gown by Alexander McQueen. Since that moment Kate Middleton became a recognized style icon not only in UK, but also around the world. In fact Kate evoked the interest to her style even before her wedding day- during the engagement party in November of the previous year she was spotted in the stylish Issa dress. Moreover, once she started dating Price William, her fashion looks were made public starting from the appearances at the friends’ weddings to polo matches. Over the years one could notice that among her favorite brands are Issa and Mulberry, but the Duchess of Cambridge also favors the high street brands like Topshop and Reiss. Let’s take a look at Kate’s fashion hits since her marriage to Prince William. Kate wore Reiss dress for the first official portrait in the status of the engaged couple. Kate visited Belfast, Northern Ireland, wearing Burberry coat and Aquatalia suede boots. Kate went for the Reiss dress and Anya Hindmarch Maud clutch for the official meeting with Michelle Obama in London. Catherine attended the wedding in Berkshire where she wore Zara dress and Anya Hindmarch Maude clutch. To the ceremony of medals presentation to Irish Guards at Victoria Barracks in Windsor Kate opted for Alexander McQueen dress and coat. One of Kate’s looks from the trip to Canada- Erdem lace dress. Catherin wore the white Reiss dress to Canada Day. To visit the War Museum in Ottawa Kate chose the grey dress by Catherine Walker. 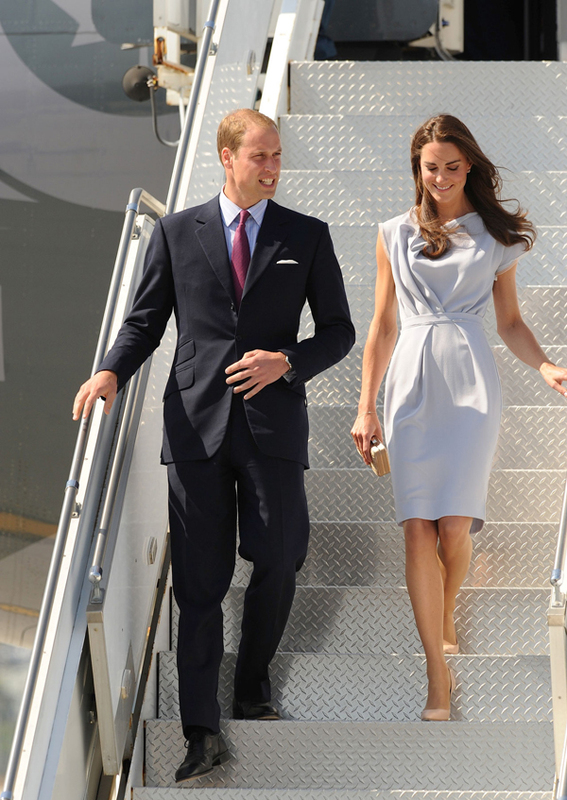 Catherine wore the Roksanda Ilincic dress for arrival in California. Kate teamed Alexander McQueen gown and Jimmy Choo heels for attending BAFTA Brits to Watch gala dinner in Los Angeles. Catherine went for Alexander McQueen black velvet dress, which she accessorized with Pretty Ballerinas clutch for attending The Sun’s Night of Hero Awards. Kate met her first Christmas in the royal status wearing elegant purple coat, Mascaro shoes and Jane Corbett hat. Catherine chose to wear the Temperley London black lace gown and Mascaro velvet clutch to the premiere of the movie War Horse. Being the Paralympics GB 2012 Ambassador, Catherine attended the London 2012 Olympic Park wearing cropped jeans along with Emilio Pucci blazer. Kate at the London premier of African Cats in Matthew Williamson dress. Catherine attending the dinner by The Thirty Club at Claridge wearing Roland Mouret dress, accessorized with Jimmy Choo platforms. Kate visited the concert at the London 2012 Olympics wearing Jenny Packham dress with Jimmy Choo shoes. Kate in Alexander McQueen red dress, complemented with Sylvia Fletcher hat and Kiki McDonough earrings. Catherine opted for the Alexander McQueen lace dress and Jane Taylor hat for attending St Paul’s Cathedral. Kate wearing the Alexander McQueen coat dress, complemented with Jane Corbett hat to the Order of the Garter service. To the Paralympics Opening Ceremony Kate went for the Day Birger et Mikkelsen coat dress. Catherine attended the dinner at the President of Singapore’s residence wearing Prabal Gurung printed dress and Prada shoes. Kate looked stunning in the Alexander McQueen gown with rich embroidery, which she wore for the official dinner at the Istana Negara in Malaysia. Catherine stepped on the islands of Tulavu wearing the delicate yellow dress.